Carl Frampton sent out a chilling message to the super bantamweight division by becoming the first man to stop Kiko Martinez and rip the European title from the stunned Spaniard in Belfast. Frampton, 25, had twice seen a meeting with the champion postponed when Martinez pulled out and had promised to make his adversary pay the ultimate price. And he did just that, knocking the 26-year-old out with a bludgeoning right hand in the ninth round. Martinez is no stranger to Ireland having stunned Bernard Dunne inside one round in Dublin six years ago and he had promised to silence the fervent home crowd once again. Frampton meanwhile delivered a career-best performance in September when disposing of two-time world champion Steve Molitor in six rounds. But the Canadian was clearly past his best on that occasion and Martinez, who shares a trainer with world middleweight champion and namesake Sergio, was expected to pose an altogether tougher test. Martinez was quick out of the blocks in the second stanza, forcing the home favourite back on to the ropes. While Frampton stuck to the game plan for the most part, boxing at range and picking his punches; when he did engage at close quarters, he was given a sharp reminder of the visitor's knockout power. Frampton picked up the pace in the subsequent round, delivering impressive combinations before withdrawing to the outskirts of the ring. By the middle of the fourth session, a bad cut had opened up under Martinez's left eye and Frampton immediately set to work with his right hand. But the Spaniard remained dangerous, landing a solid left jab, perhaps sensing that his days were numbered, only to be pinned against the ropes as Frampton sensed the finish. 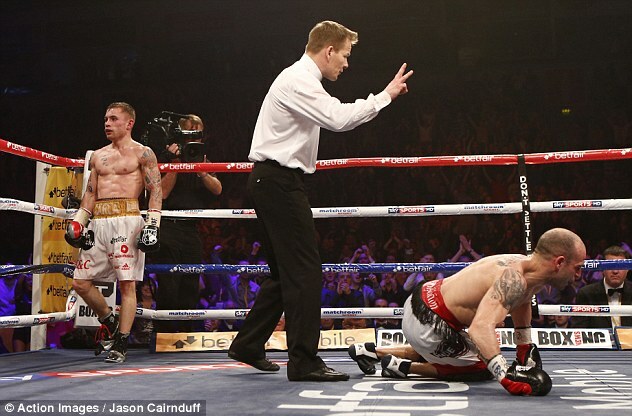 Although Martinez continued to stalk his prey in the fifth, Frampton was proving more and more elusive, slipping and sliding out of range as he moved further ahead on the scorecards. A quieter sixth round followed but Frampton upped the pace again as the fight entered its second half. Martinez, whose cut opened again, was more reluctant to come forward and the Belfast favourite landed several plum shots. Frampton was drawn into a toe-to-toe brawl at the start of the eighth round but slipped on to the back foot as the session progressed, allowing him to pick his shots with unerring accuracy. Martinez had shown exactly why he had always heard the final bell when he shipped several huge shots at the start of the ninth but his resistance proved futile when a huge straight right left him floundering on the canvas. The Spaniard rose unsteadily but after staggering back towards his corner, the referee waved the fight off. Frampton, who was ahead on all three scorecards by four rounds (twice) and two rounds on the third, extends his unbeaten record to 16 professional contests. Frampton, who will likely return to Belfast on May 11, potentially in a final eliminator for the IBF world title, said: 'I can't remember much about the knockout punch. It was a decent shot. 'I proved I've got a good chin. I could feel his power but he didn't hurt me. He didn't make my legs wobble but you can see from face that he hits hard. 'He's not been wobbled before but I took him out. The plan was to box from the outside but when we traded, I felt I got the better of him. Carl Frampton came through the toughest test of his career to stop Kiko Martinez and claim the European super-bantamweight title on Saturday. Frampton, undefeated as a professional boxer, was forced into the trenches at times against the gritty Spaniard, but his technique, footwork and speed advantage all made a difference as he eventually stopped his rival in the ninth round. It was a short, sharp, right hook that ended the contest for the 25-year-old, who looks destined to be a star on the world stage. Martinez came to fight, and more pertinently came to make Frampton fight, but he simply did not have the class of the Northern Irishman. Twice before the pair had been scheduled to meet, but on both occasions Martinez pulled out. 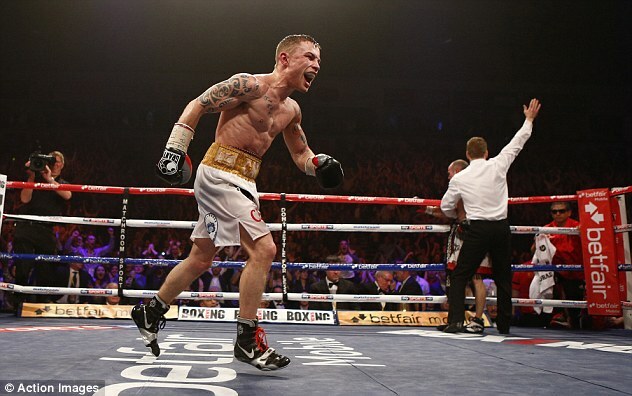 Those 18 months only served to help Frampton improve, and his quality was a level above his foe. After a cagey opening round edged by Frampton, Martinez cut off the ring much better in the second and landed two big hooks to concern the home crowd. 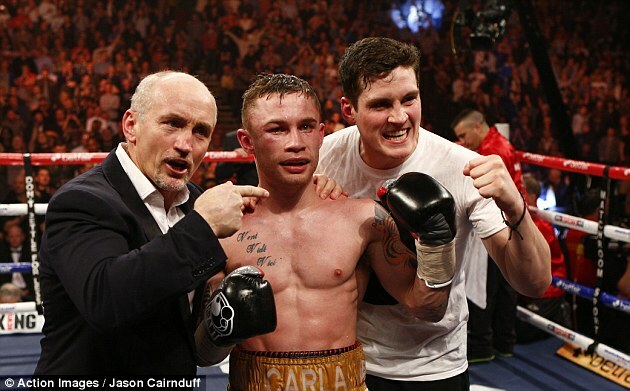 Frampton responded in the next with a series of sharp combinations and he wobbled the champion in the fourth. Martinez was carrying heavy swelling under one eye as technique continued to overcome brawn, although on occasion Frampton still got drawn into all-out wars - notably in the seventh when Martinez rallied again. 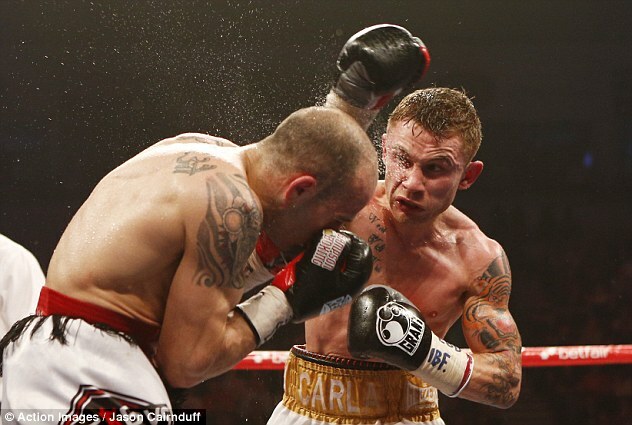 Frampton eased off in the eighth but then exploded again in the ninth, when the fight ended in fitting fashion. Martinez, pushing forward as always, walked onto a sharp right that dropped him to the mat, and when he attempted to get back to his feet he staggered backwards as Frampton clinched the European crown. Earlier in the evening, Lee Selby delivered a solid defence of his British and Commonwealth featherweight title, outclassing Martin Lindsay for a unanimous 118-110 117-111 118-109 decision. Lindsay showed courage and heart but took a catalogue of heavy shots as Selby came close to finishing the bout in the latter stages. Early on it was the body shots of Selby - digging into the ribs of Lindsay - that began to break the challenger's defences. He then mixed up his shots as Lindsay tired, inflicting heavy bruising to Lindsay's face as a series of hooks landed, and truthfully it was only the pride of the former champion that ensured the fight went the distance. There's no better way for a guy who is known to fight fans in his own vicinity but who one day would like to make a world splash than to splatter his foe, theb to notch a killer KO, as Carl Frampton did on Saturday night in Belfast, Ireland. Kiko Martinez, age 26, went down in a heap, and the Belfast resident Frampton inserted himself on the one to watch list at 122 pounds for more than a few US fight fans who loved his counter right on the button in round nine. The Spaniard Martinez threw a long overhand right, which landed some, but left his chin on a platter for the 25-year-old Frampton. A tight right to the chin sent the loser to the mat for the count. He rose but was too unsteady to continue, in the eyes of the referee. The end came at 2:46, and Frampton (now 16-0 with 11 KOs) picked up the European super bantam crown from Martinez (now 27-4). A fight against Scott Quigg could occur sooner rather than later. The 25-year-old Brit holds the interim WBA super bantam crown and hashing out terms, and pieces of the pie might put the match off for awhile, as Frampton promoter Eddie Hearn post-fight tabbed Frampton as the future star, insinuating Quigg would need to accept a lesser cut. Promoter Hearn said the kid could fight in May, and that he wants a world title. Frampton fights well off the back foot, as our man Lee Wylie likes to say, has excellent mobility, mixes shots nicely, stays composed even when pressured, puts together combos well...lots to like there.